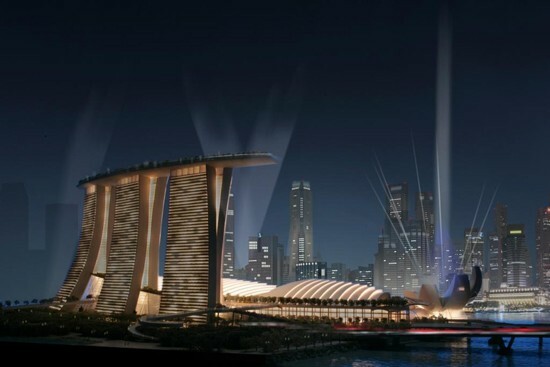 Architect’s rendering of the Marina Bay Sands development, which will be home to the inaugural Art Stage Singapore art fair in January 2011. Courtesy Art Stage Singapore. (Singapore) Since 2007 alone, the Asia-Pacific region has seen a flurry of activity in its international art fair circuit, with events launching in Hong Kong, New Delhi, Seoul, Shanghai and Tokyo among other places in the past three years. Each of these events brings with it the hope of tapping into the still nascent regional market for contemporary art, but few have actually met the expectations with which they began. The latest entry to the field is Art Stage Singapore, to be held in Singapore in January 2011 at the new Marina Bay Sands waterfront development. The move follows a series of government-backed initiatives to promote contemporary culture in the Southeast Asian city-state, among which include the establishment of art festivals the Singapore Art Show and the Singapore Biennale, and extensive infrastructural development of museums and educational resources. Reflecting the ambitions for the fair, Art Stage Singapore’s organizers announced earlier this year that Lorenzo Rudolf, who in the 1990s turned Art Basel into one of the world’s premier events for modern and contemporary art and who also oversaw the launch of the ShContemporary art fair in Shanghai in 2007, will be fair director. Rudolf will have at his disposal the best resources that Singapore’s government can provide, but he faces the challenge of convincing regional and international galleries and collectors alike that Singapore can become a destination for high-quality contemporary art. A short-lived predecessor to Art Stage Singapore held in 2008 coinciding with the Singapore Biennale, Showcase Singapore, featured a clutch of blue-chip galleries including China’s ShanghArt, France’s Thaddeus Ropac and New York’s Sperone Westwater, but never had a subsequent edition, while the longer-running ArtSingapore, established in 2000, has been unable to attract top-tier international participants. ART iT recently met with Rudolf to discuss his plans for the Art Stage Singapore and the potential for a regional contemporary art market. ART iT: The past few years have seen new art fairs come and go across the Asia-Pacific region. What can Art Stage achieve in Singapore? LR: There is a young, growing art market in Asia and it’s important to show this market quality. Even if the local art scenes are all growing here, many of them lack strong institutions. In other words, there aren’t hundreds of strong galleries to choose from, so you have to be careful not to make the fair too big. The focus of Art Stage Singapore will be on quality, and that means we will start with only around 100 galleries, with about half from the region. You want to try to guarantee that the participants have a chance to be commercially successful. ART iT: Where do you expect the collector base to come from? LR: I think we can attract local, regional and international collectors. Southeast Asia has a rapidly growing collector base, and these collectors dearly want to support this fair. When I invented the new concept for Art Basel in the 1990s, we took a decision that I think is quite significant. We decided that the main client of the art fair is not the gallery but the collector. And it was absolutely right. So we are integrating the local and regional collectors here, not only as support, but also as brainstorming partners. At the same time we have scheduled the fair in a slot when nothing else happens in the art market and when people in the US and Europe tend to travel. So the goal is also to build up a fair that can showcase developments in Asia to an international audience, and give them the chance to travel here and discover new things. We are developing an intensive program for international collectors, organizing trips to Indonesia to visit artists’ studios and so on. ART iT: Are you coordinating programming with local institutions such as the Singapore Art Museum, the National Museum and other art spaces? LR: The advantage of Singapore is that when you collaborate with the institutions, you are collaborating with the government. Art Stage Singapore is the first project in Singapore for which the major state agencies have made a support task force. That begins with the National Arts Council, continues to the National Heritage Bureau, the Tourism Board and on to the Economic Development Board. All these agencies are involved in the task force. Nor do I see this as an event that comes only once a year and then vanishes. It must be a catalyst for the local art scene. Parallel to the fair we will organize a large-scale exhibition that will take place partly at the Singapore Art Museum and also at other venues. Through this exhibition we want to do something that has never been done in Asia. In Europe or the US, you have major works by major artists hanging in public museums. That means there is public access to these works. In much of Asia, because you don’t have these public institutions – and if you do, few of them are actively buying – everything is in private hands. There may be a few private museums, but most of the works are in storage places and warehouses. So through this planned exhibition, which will recur annually, we will bring together Asian contemporary art masterpieces from major collections in collaboration with the collectors themselves. And we will also develop an education program where we work with the museums and the universities in the interest not only of an Asian art market but also in the interest of educating the local community. ART iT: Is there any particular kind of international gallery you are thinking of inviting? LR: We all know that we are living in a world of brands, and you need certain brands to make a high-profile event. But Art Stage Singapore will focus on content. I don’t think it makes sense to have 20 top brands from the West who all bring some Warhols because they know Warhol is another brand they can sell. That cannot be the goal of an Asia-Pacific event. I think we have to focus on galleries that already work with Asian artists, or galleries that represent artists that we want to introduce to the Asia-Pacific audience. The goal must be to showcase the strengths of contemporary art in the region and to bring that art into a dialogue with the contemporary art from the US and Europe that makes sense in this context, and to not only run behind brands. ART iT: Having just completed its third edition, Art HK is now widely regarded as Asia’s leading art fair, and it also has the advantage of Hong Kong’s strong auction market. How can you present Singapore as a worthwhile alternative to Art HK? LR: My goal is not to build up a competition with Hong Kong. As I said before, we are here in a region with a growing market and the first priority is to do everything we can to support and strengthen this market. That means we need more than one art fair. Hong Kong works well because it has a concentration of market events coming together around the auctions and the fair. Unfortunately, we don’t have such a concentration of market events in Singapore. That means we have to go in other directions, like working on museum exhibitions, and that’s the way we are headed. My concern is establishing the independence of the Asian contemporary art market from that of the US and Europe. It cannot be the case that the Asian art scene is only recognized when it is somewhere at the edge of Art Basel or Miami Beach or the Armory Show. True recognition will be achieved when collectors from all over the world come to Asia because it is strong enough to offer them attractive events.